Did you know that you have within you the portal to all the guidance and inspiration you need to ride the waves of these changing times? This portal can be called your Higher Self. Archangel Gabriel introduced me to my Higher Self in 1990, letting me know that this was the way that I connected with the messages he was sending me. Recently I was told that the Archangels have lifted the veils and are actively working between dimensions to make the bridge more graceful between your conscious mind and your Higher Self. Considering the magnitude of the shifting sands of beliefs and the events that are impacting millions of souls, it is not surprising that the Archangels would intervene to assist people so they could contact the realms of Divine Guidance more freely. If you are comfortable with the idea of Angels working with you, consider inviting them to assist you in many areas of your life. The Angels will work through your Higher Self, that aspect of you that is connected to your soul and contains the Divine Spark. They are using the link to your Higher Self to help coordinate your awakening consciousness. It is a big help to have your Higher Self filter the energy frequencies and allow you to only receive that which is appropriate for you. From the time of my first contact with Archangel Gabriel, he was very clear about the role of my Higher Self in making connection to the dimensions that allowed me to receive guidance and wisdom. The teaching tools he gave me, such as the Angelic Alignment posted on my Resources site, made it possible for me to align with my Higher Self through the chakra system, and create a connection I could learn to trust. The seed of God that you can call your Higher Self for simplicity’s sake, is so in touch with your soul that they work in tandem to bring about the fulfillment of your spiritual purpose on Earth. Whenever you feel lost – it is your Higher Self that is missing from your conscious awareness. Taking the time to raise your vibrational frequencies in order to connect with the link to the Angelic Dimensions and all your guidance systems, offers you an experience of the living presence of Divine Love that will melt your resistance and feed your heart in a way nothing else can. When those who have been traumatized by the organized religions throw away the idea of a Higher Power, their minds often cut off inspiration from the Higher Self. Yet when they ask for help thus opening to higher energy frequencies, the intuition that comes through them is brilliant. Some who profess to be non-believers have become very proficient at finding parking spaces! Yet they do not believe it is inspired by the Angelic Realms or their link to intuition from the God spark within their Higher Selves. There are many names for the Higher Self. In truth it is the portal to the most sacred, authentic, divine, eternal part of you. This Higher Self is your link to the God Mind as well as your soul purpose. Your Higher Self acts as a bridge between Heaven and Earth, bringing you all that your soul needs to fulfill your Divine destiny in this lifetime. Your Higher Self will act as a filter so when you decide to open yourself to new teachings and inspiration, you can command your Higher Self to allow only that which is in your highest good to come to you, aligned with your soul purpose and appropriate for your next steps in life. Because millions of Lightworkers have been so powerfully successful in bringing more Light to the planet in the past years, the Archangels have lifted the veils between your Higher Self and your conscious mind. You can now have clear direct contact in a way that was never before possible. One of your greatest gifts is within you awaiting your command. 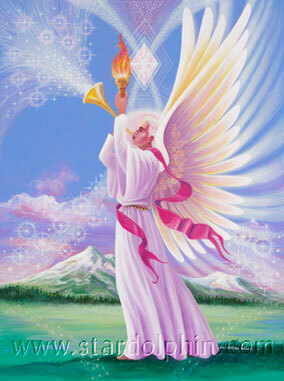 Your Higher Self offers you a key to awakening communication with your Angels, Guides, and Master Teachers. Your Higher Self takes the questions and desires of your soul, then feeds you inspiration to provide answers and the creative solutions you require so you can fulfill your life purpose. Your Higher Self is the greatest friend you have within your human form. It is the link to becoming the Blended Being, in touch with the Light from the Highest Source of Love as well as the connection to your life as a physical human active in this world. Your Higher Self is the most awakened part of your full human manifestation. Integration of the Divine spark within your physical world begins to flow with so much more grace when you initiate access to this aspect of yourself that ALWAYS has your highest good as the paramount focus. You can trust your Higher Self and truly believe that when you ask for assistance, you can safely open to new guidance, wisdom and the creative solutions that will be gracefully provided. Perhaps you have such a low idea of who you are that you can’t imagine a part of yourself that could be so elevated or wise or important. And yet if you can only glimpse the beauty and sacredness that is inherent within your Higher Self, you would see the greatest love you have ever known there within your own being. You would be able to receive floods of energy from the Light of Divine Love, the greatest nourishment your body, mind and soul have ever known. The Divine Activity of this energy center will feed you in a way you have longed for, and you will feel fulfilled. You can actually begin to love yourself in the way that is so necessary for your awakening. You will start to have Loving Acceptance for the challenges you encounter as a soul in a human body working in this world. This could be the beginning of one of the greatest relationships you have ever known. Your Higher Self awaits your attention.